It’s hard to find good Southern cooking on the West Coast. 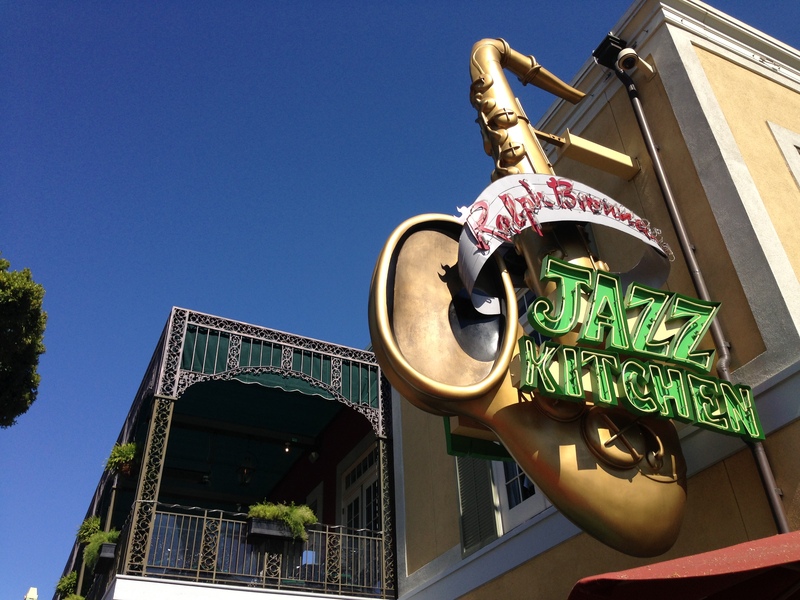 But I think I’ve found the place to go – Ralph Brennan’s Jazz Kitchen. The flavors coming out of this place have all the aroma of a true kitchen of the South. The many dishes include classic Southern favorites like shrimp and grits, Southern fried chicken, fried green tomatoes, blackened fish, jambalaya, gumbo, and Cajun cornbread. It has the ambiance of a patio restaurant you might find on the Bayou with the wrought iron metal and lush foliage hanging down and around the place. If you want to spend time in deep conversation, you should sit outside the main room when the band is performing. While they are good musicians, it can be overwhelming for a good talk between friends. Prices are on the high side with appetizers ranging from $8 to $14 (although I ordered Fried Green Tomatoes on the side for $6 which would have served as an excellent appetizer). The average dish is in the mid-twenties. But if you’re looking for quality, you definitely get what you pay for. The taste is excellent and besides a rather lackluster Caesar salad, everyone at our table had a terrific meal. 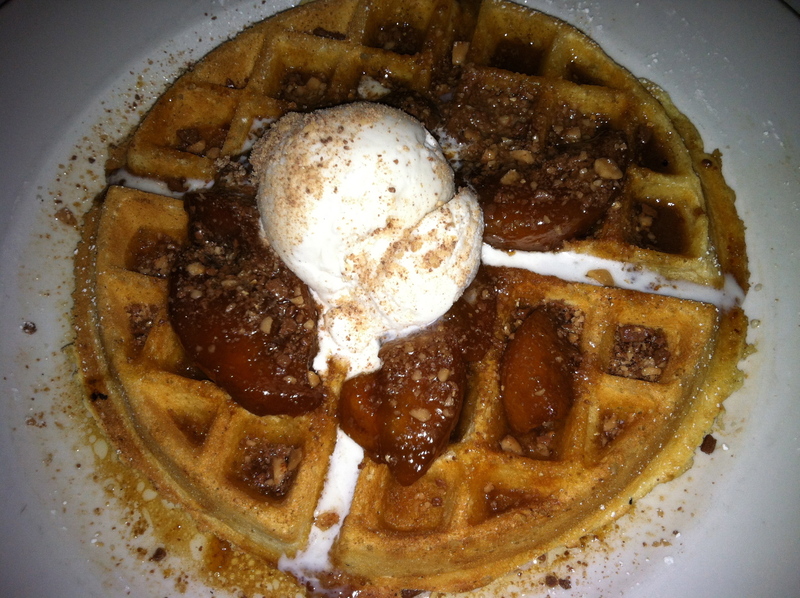 The menu does change from time-to-time and I was disappointed that one of my favorite desserts, the Peaches and Cream was gone (a delectable waffle covered in peaches and peach syrup as well as bits of pecan topped with a grand scoop of vanilla bean ice cream). I was afraid I wouldn’t find a good substitute, but I should not have feared. Indeed there was a more than suitable replacement – Lemon Ice Box Pie. Yum. Friends enjoying a night out together at a good restaurant. 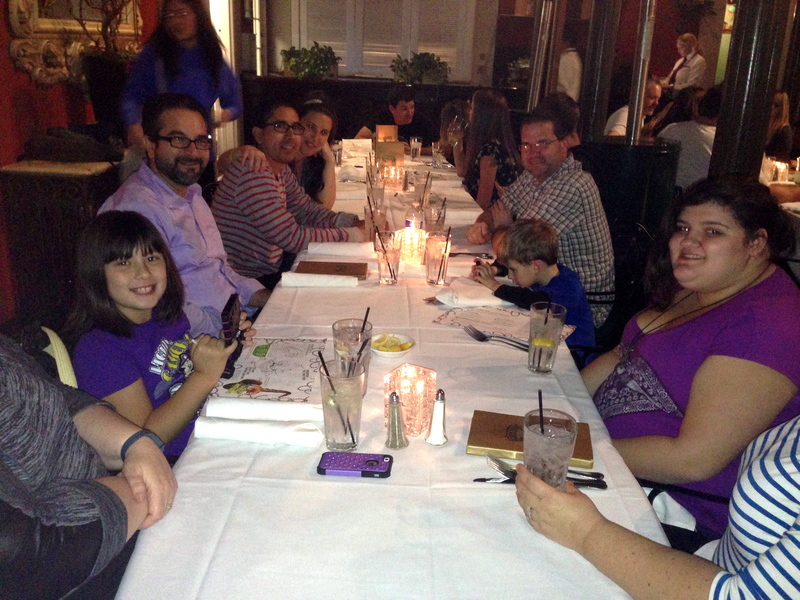 With a group as large as ours was on this evening (17 of us), we made reservations a couple days in advance. Always a good plan, even with a smaller group. We asked for a table away from the music and they were not only able to seat us, they were able to grant our request. We got seated very quickly and our waitress was excellent! She was prompt, refilled drinks quickly, and remembered exactly who ordered what. I was impressed by her level of service especially with so large a group. We ordered (and she even divided up the checks perfectly – even though Cassie and I were seated at opposite ends of the table) and the food that was served was terrific. 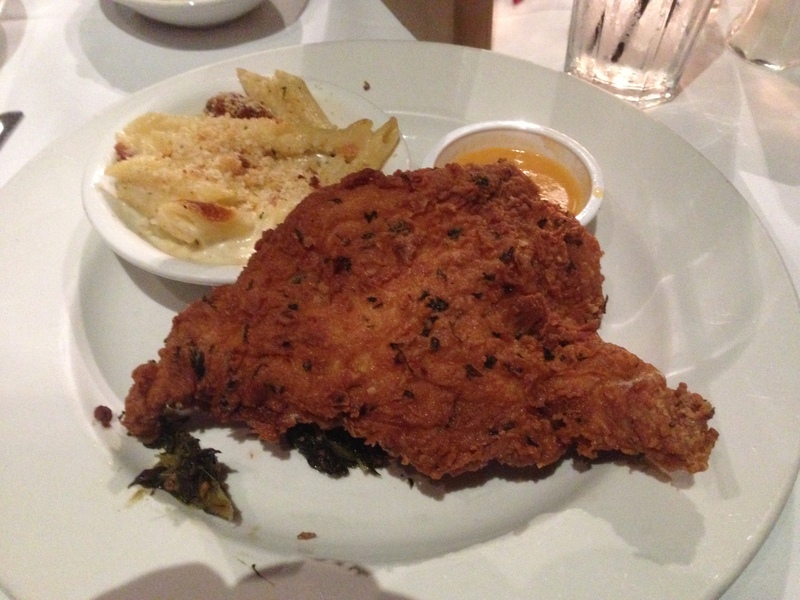 I had the Southern Fried Chicken and with the exception of one small bone, it was boneless – and cooked perfectly. Not dry as chicken often gets, but juicy, hot, and delicious. The crust was crisp yet flavorful. It rested on a bed of Southern greens which also was yummy and came with a tasso-herb-bread-crusted mac and cheese. Yum. I convinced a couple of friends to order the same as I did, but there were so many great dishes on the table – a gumbo that was creatively served (you have to just order it), pan seared salmon which sat on a bed of risotto, shrimp and grits, and other terrific food. My wife, Cassie, had the popcorn calamari as an entree and it was also very good (although a bit salty for her taste). 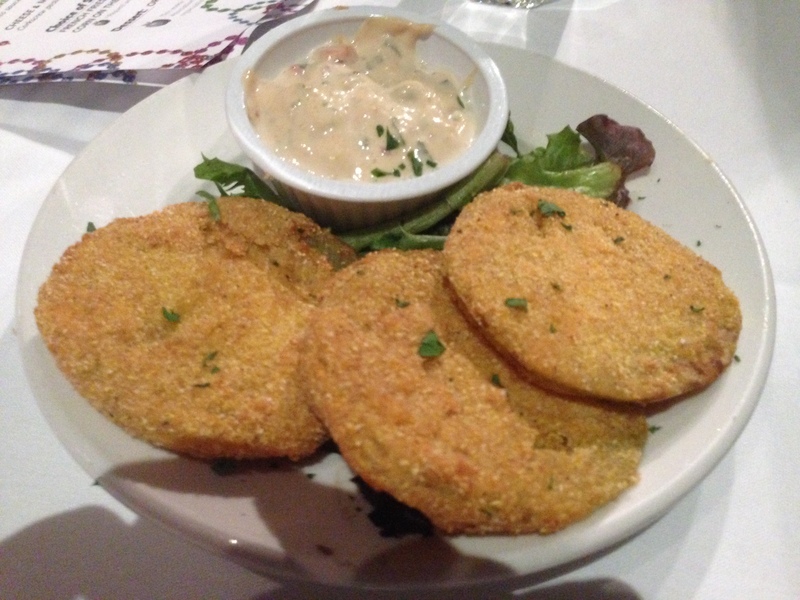 I did have the Fried Green Tomatoes – they were harder than I usually like them, but the remoulade that came with it was great. For dessert, I told you I missed my Peaches and Cream, but found an amazing Lemon Ice Box Pie. It had the light creamy texture of a more simple pie, and the flavor of a key lime / lemon pie (I know it’s lemon, but it had a lighter tang more akin to key lime). The cream served with it was the best and it was served on a spread of raspberry coulis which complimented it perfectly. I was in pie heaven. It was so good I forgot to take a picture. Cassie ordered the beignets and of course they were delicious, served with a generous helping (or heaping) of powdered sugar. Easy to share, they come in small and large portions. If you’re looking for Southern style cooking West of the Mississippi, you need to come here. This is one place that serves it like it’s meant to be made. And don’t forget to get your parking validated! Just an added tip. Tip #1: If you want a chance to engage in deep conversation, ask for a table away from the band, preferably in the patio area. Tip #2: Make reservations to minimize your wait. Like any Disney restaurant you can call through their dedicated dining hotline but you can also call the restaurant directly at (714) 776-5200. Tip #3: Many of the “Side Dishes” can be ordered as suitable appetizers, especially for couples. Some suggestions include the Fried Green Tomatoes and Cajun Corn Bread. While I sometimes go to the Jazz Kitchen Express for their beignets, it’s been years since I went to the sit-down restaurant side. Reading your post makes me want to go back again really soon! Next Next post: You Thought Mary Poppins Has Come to Save the Children?